Experience the ultimate high life! Stay at Island's Edge Luxury Villas Mauritius for prestigious high end accommodation on the water's edge and the holiday of a lifetime. Villa Infinity (4 bedroom en suite) and Villa Elegance (3 bedroom en suite) inspire romance and are intimately exclusive with private infinity pools at eye level with the turquoise blue sea. If you are looking for a breath taking villa rental in Mauritius, Island's Edge is the most stunning shorefront property that offers supreme and unprecedented levels of luxury, style and security. Poised for a remarkable island getaway, these lavish villas distinguish themselves by their discreet, personal and impeccable service, their picturesque views, unique location, style-conscious decor and its top-notch facilities on one of the most beautiful islands known to man. The original villas have been recently remodelled with no expense spared. Tastefully furnished throughout, they have been designed with practicality in mind. Island's Edge offers two villas on the water's edge overlooking Pereybere Beach with magnificent panoramic views of the bay, swimming beach and ocean. Landscaped gardens lead to the gazebo with 270 degree ocean views. Self catering with a difference! 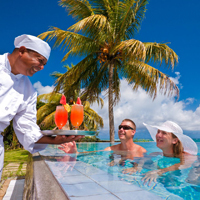 Your own personal chef ensures superb dining can be enjoyed without leaving your villa. Your chef will prepare whatever you wish, suggest a menu or will propose some local specialities if that takes your fancy. Villa pre-stocking - Guests may send a list of groceries upon booking and we will gladly purchase these for you at the same price as the supermarket with a reasonable delivery fee. Be it a wedding, honeymoon, corporate incentive, networking event, or simply a well-deserved helping of extravagance, we can offer you the ultimate relaxing experience, treat yourself to a stay at Island's Edge Villas, seeing is believing! Planning your wedding day on the beautiful island of Mauritius is the most exciting time of your life! Having a destination wedding is an incredible way to start your life together as a couple. Your Island's Edge wedding will not just be a one day celebration with your family and friends but instead a vacation filled with memories to last a lifetime. If you wish to organise your wedding at Island's Edge, our "A to Z" dedicated wedding planner can help you with all preparations pertaining to the wedding ceremony and reception. Unlike other mainstream hotels in Mauritius, we genuinely take our time to ensure you feel special on that magical day. We cater for a maximum of 50 guests, please contact us for detailed information - you'll be pleasantly surprised! 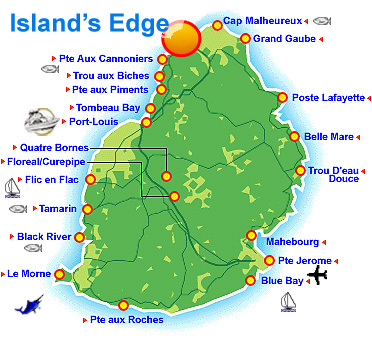 At Island's Edge you don't have to worry about washing the dishes or ironing your shirt. You can spend your holiday the way you like, with the people you like, free from stress and distractions, surrounded by only friendly smiles and endless possibilities. And if you really must check in with reality on the odd occasion each room is equipped with complimentary Wi-Fi and satellite television. 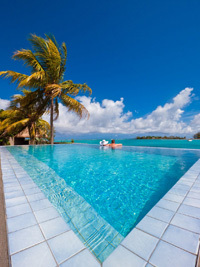 This part of Mauritius is as close to heaven as you can possibly imagine! 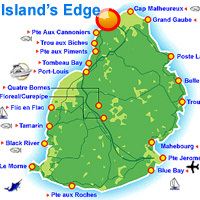 Pereybere is situated in the North of the island near Grand Bay approximately an hour from the airport. The villas are close to restaurants, shopping malls, markets and vibrant night life for those young at heart.